Indian Equity Markets had a very disappointing session as the NIFTY slipped below its very crucial 200-DMA to end the day below it. Markets remained in the declining trajectory for the entire session and the NIFTY ended the day losing 100.90 points or 0.99%. Advance-Decline Ratio remained heavily in favor of the declines. As we approach Tuesday’s trade, we stare at a probable break of key support levels. We are presently dealing with the two most important support levels of the recent past. The first level is 10163 which is the 200-DMA on the Daily Charts; and second, is the 28-month long upward raising trend support of 10040. The zones of 10040-10163 are expected to provide very serious support to the Markets failing which we will stare at a possible initiation of a intermediate bear t rend. Tuesday will see the levels of 10160 and 10230 as a potential resistance area. Supports come in at 10040 and 9980 zones. There are still chances that NIFTY might hold on to these supports at Close. The Relative Strength Index – RSI on the Daily Chart is 34.0379. A bullish divergence is observed. NIFTY formed a fresh 14-period low while RSI did not. The Daily MACD has reported a negative crossover. It is now bearish while trading below its signal line. If we look strictly at the pattern analysis, though the NIFTY has ended below its 200-DMA, it still stays within its filter. 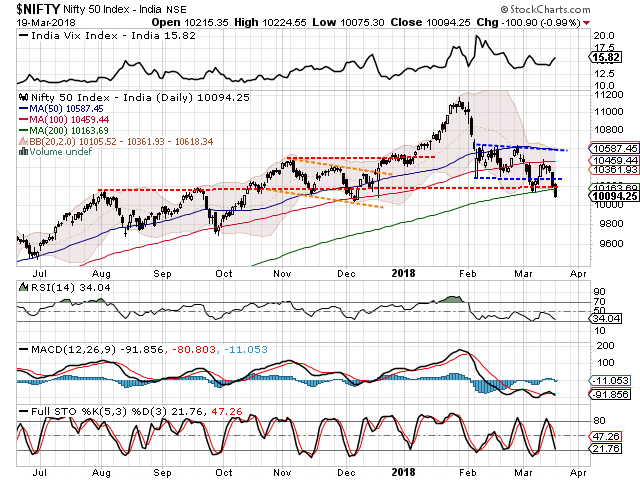 Further, it also eyes another important pattern support of 10040 which remain in very close vicinity. On a theoretical note, NIFTY still has chance to avert more weakness if it manages to crawl above 200-DMA again. Overall, it would be extremely crucial to see how the Markets behaves vis-à-vis the levels of 10040-10160 at Close levels. The NIFTY will be able to avert the weakness if it manages to crawl back above these levels. 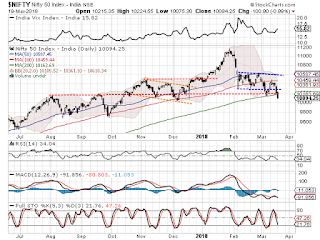 However, at the same time, we now have to take into account the fact that if the levels of 10040 is significantly breached, we are staring at some prolonged weakness and the levels of 200-DMA will become a resistance for the Markets in the immediate short term. We advice refraining from taking any major directional view until a validation of the current trend comes. A highly cautious view is advised for tomorrow. Amid chaos, fresh longs were also seen being added in stocks like NALCO, SRF, TATA COMMUNICATIONS, DIVIS LAB, GAIL, RELIANCE, POWER GRID, STAR, MARICO, GRASIM, PETRONET, LARSEN & TOUBRO and TITAN.